- Buy him a high value stamp that he hasn’t been able to or will simply not buy. - Buy him a duck stamp or the new express stamp. If he likes foreign stamps, buy him a British definitive and he will love it. You might have to search around a little for it but a postal administrations list will help you with the job. - A new catalog: Many collectors don’t invest in a new catalog for years. Also, stamp values don’t change regularly and so, it is not very necessary. However, if your stamp collector friend has a catalog that is more than three years old, he needs a change. Buy him a new catalog and he will love it. - A collection of a country’s latest issues: If he is diligent enough, his collection may already include latest stamps, of the current year. But you could always buy him a yearbook with all the latest stamps. If he has two of the same kind, he can always trade them with others. If you are looking for foreign new issues, you can take help of the postal administrations list aforementioned. - A book with a stamp collecting related subject: Know that your collector friend doesn’t just like playing with stamps but also reading about them. Such books might seem boring to you but he will definitely love them. Books with history of stamp collecting and information about buying and selling stamps will be nothing short of thrillers for him. - Stamp Collecting Application: Stamp collecting software is a great gift because it enables the collector to organize, track, and value his collection easily without hassles. - A weekend at a big show: He will definitely appreciate this gift. Yes, we know that it is not fun at all to watch your loved one pour over stamps for hours together. But why not let him enjoy his hobby at a big show? There is the American Stamp Dealer’s Association, for example, which will help you find out what shows are coming up and when. - Stock Pages: This may not be exciting but it is definitely practical. He will keep collecting stamps and one fine day he won’t have enough space to store them. Enter stock pages. - Membership in a philatelic club or organization: Get him a membership at the American Philatelic Society. Don’t be under the impression that it deals only with U.S. stamps. It is just its name. The society also provides numerous benefits to members. Your stamp collector will love the gift because he will now have hundreds of members who share his hobby. You can find more clubs other than this particular one too. 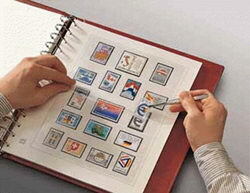 - Time alone with his stamps: This is cost-free and effort-free. Just leave him alone with his stamps! Give him a day off every now and then so that he can spend time with his hobby for as long as he wants.